The Dassel-Cokato School Board meets the second Monday and fourth Thursday of the month at the district office, located on the high school/middle school campus. 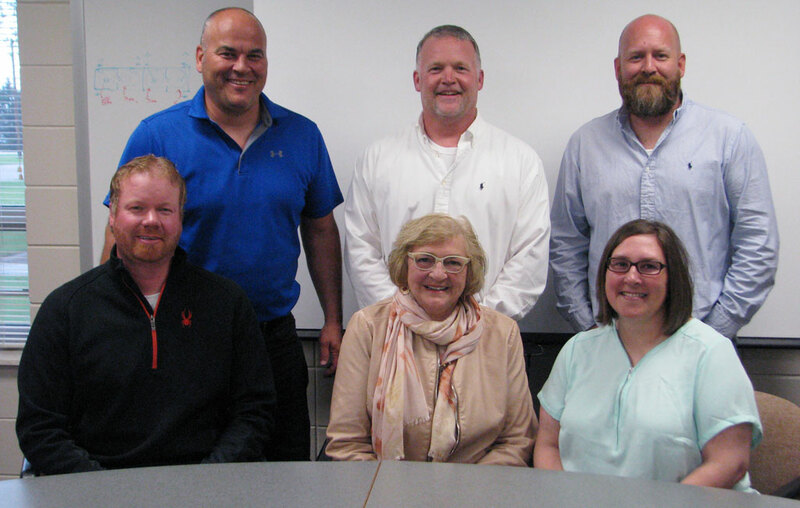 Pictured are school board members: front – Bill Aho, Irene Bender, Rebecca Clemen (board chair); back – Chuck Nelson, Dave Sangren, and Andy Engh. The Dassel-Cokato School District continues to be successful, due to the strong relationships it has with the communities of Dassel and Cokato, and families who live there. In 2014, DC High School made the top 30 of 610 high schools in the state of Minnesota. For this achievement, the school received a silver medal by US News & World Report, which works with the American Institute for Research in Washington, DC to generate the report, based on “the key principle that a great high school must serve all its students well, not just those who are college-bound.” It uses state proficiency benchmarks as indicators. Schools were also assessed on the degree in which they provide college-level coursework. To achieve its goals, the DC School District strives to keep a healthy fund balance, competitive contracts, and reasonable class sizes. The school board’s leadership is student-centered and conservative, continuing a long tradition of sound governance. In addition to maintaining and improving programs for students, the district is able to provide high-quality facilities for both academics and extracurriculars. In 2013, the district implemented a new controlled access policy, installing a buzzer and camera systems at the entrance of each building as an added measure of security. The school district’s k-12 population is about 2,200. Schools include Dassel Elementary, located in the heart of Dassel; Cokato Elementary, located next to Peterson Park near downtown Cokato; the Dassel-Cokato Alternative Learning Center (ALC), located on Highway 12 in Cokato; and the Dassel-Cokato High School/Middle School, and the Early Childhood Family Education Center, all located between Dassel and Cokato on US Highway 12. The Cokato and Dassel communities combined schools in 1972, building a new high school facility on Hwy. 12. In addition, the middle school was built connected to the high school facility, opening its doors to its first students in 1990. The performing arts center (PAC), an 800-seat auditorium used for a variety of school and community events, was the most recent addition to the complex, in 2004. Along with the PAC came a 2,000-seat gymnasium, and a new football field and track. In all levels of learning, Dassel-Cokato Schools teach the pillars of character education: respect, responsibility, resiliency, integrity, compassion, and understanding diversity. Along with the pillars, the schools have adopted the Olweus anti-bullying program, teaching students to step up and stop bullying inside and outside of school. Every educational room throughout the school district is equipped with SMART boards, which are interactive whiteboards that provide more learning opportunities for all teaching styles. Strong partnerships and a dedication to every student are at the foundation of the DC Public School’s tradition of excellence. The school can be reached at (320) 286-4100. Visit www.dc.k12.mn.us for further information on each school, and a staff directory. Both Dassel and Cokato elementary schools were named 2004-05 Schools of Excellence by the Minnesota Elementary School Principal’s Association. Cokato Elementary has an enrollment of about 520 in kindergarten through fourth grade. It is located at 200 Fifth Street SW in Cokato. To contact Cokato Elementary, call (320) 286-4100, ext. 1300. Dassel Elementary has about 350 students enrolled. It is located at 131 William Avenue E in Dassel. To reach Dassel Elementary, call (320) 286-4100, ext. 1500. Both elementary schools participate in the Minnesota Reading Corps program, which provides trained literacy tutors for children ages 3 through third grade. In 2014, the elementary sites began offering all-day kindergarten five days per week. All schools encourage parents to volunteer by getting involved in their children’s school experience. They can do so during a number of events and activities throughout the year. Additional information is at www.dc.k12.mn.us. During the 2014-15 school year, the middle school added two more classroom sets of laptops in sixth grade, to continue the district’s goal of providing students more learning opportunities through access to technology. To open enroll in Dassel-Cokato Middle School, call (320) 286-4100, ext. 1600. Dassel-Cokato High School believes in promoting positive relationships, personal responsibility, and academic rigor in order to prepare students for success in a changing world. Along with a range of academic opportunities, including advanced placement (AP) and college-credit courses, the high school offers a variety of extracurricular and co-curricular activities for those interested in participating in athletics and fine arts. DCHS believes in being responsive to the needs of students and challenging them to reach their potential. With this in mind, students recently began using laptops to expand the ways they learn new information. Along with the computers, teachers receive ongoing staff development training to help them make the best use of the technology available. For the 2015-16 school year, DCHS offered an optional take-home laptop for every student every day. Available technology, combined with differentiated curriculum and teaching strategies, will better prepare students for the schools or workplaces they will enter after high school. The high school also offers courses taught at the school that equate to more than 70 college credits through Southwest Minnesota State University, St. Cloud State University, Ridgewater College, and the University of Minnesota. The high school can be reached at (320) 286-4100, ext. 1800. Dassel-Cokato Community Education provides lifelong learning experiences for people of all ages, abilities, and cultures through programs and services offered year-round. Programming includes youth enrichment and recreation, adult basic education, life-long learning, and recreation. DC Community Education also provides school-age child care through the Charger Kids Club before and after school, and all day in the summer. Each year, DC Community Education also sponsors Dassel-Cokato Community Theater productions. Small-cast, non-musical productions are performed in the small, intimate theater at Dassel History Center/Ergot Museum in the winter; large-cast, musical productions are performed in the PAC in the summer. The Fungus Amongus Players 2015 winter production of “The Romancers” was selected to be performed at the National Association of Community Theatres Festival June 23-27, 2015, in Grand Rapids, MI. The road to this prominent national competition began March 22, 2015 when the Fungus Amongus Players’ performance was awarded Best of Festival at the 2015 Minnesota Association of Community Theatres (MACT) Festival. Activities and enrichment courses vary throughout the seasons. Visit the community education website for details on programming, www.dc.k12.mn.us/commed, or call (320) 286-4120. The Dassel-Cokato Early Childhood Center is located on the Dassel-Cokato High School/Middle School campus, and its programming is under the umbrella of Dassel-Cokato Community Education. Providing services to families with children ages birth through kindergarten, programming includes Early Childhood Family Education (ECFE), school readiness Play ‘n’ Learn Preschool and early childhood screening. More information regarding these programs can be found at www.dc.k12.mn.us/ecfe, or by calling (320) 286-4120.